The only suspect to his best friend’s murder.... 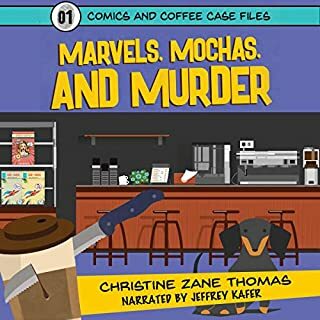 When Kirby Jackson’s friend Ryan is found dead in the comics and coffee shop the two co-own, Kirby quickly becomes suspect number one. Perhaps things wouldn't look so bad had Kirby not been planning to cut Ryan out of the business. The only witness to the crime, Ryan’s stubborn dachshund, might hold the keys to solving the case. But his attitude toward anything and everything that isn’t his warm doggy bed is less than helpful. A city under siege. One halfling knight. An Epik Quest. Epik thought he’d found what he was looking for: magic, adventure, and friendship. He’d saved an entire kingdom. But at what cost? Without his mentor, learning magic seems an impossible feat. And becoming a knight is proving...different than he ever expected. A new enemy rises, and the city is under attack once more. The ten years of peace and prosperity promised to Dune All-En was over almost before it began. Epik must heed the call. He and his band of misfit souls - Todder, Myra, and Gerdy - embark on a quest that takes them across the realm. But what they find in King's Way shakes them to the core. A kingdom supposed to be seething with dark magic seems oddly empty of any magic at all. Featuring magical jousts to rival both March Madness and WrestleMania III, grandiose feasts that many in Westeros would envy, and a cast of quirky characters that stick with you well after listening, Knowing Is Halfling the Battle is a rip-roaring romp through the Arthurian realm of knighthood. Join Epik in his second adventure. The very first thing I want to comment on is how much I absolutely love the cover of this book. It completely sums up everything that it entails in one simple picture. The art itself is nice and pleasant to behold, and matches the first book's cover as well. It also lets the reader know that the book is not competely serious, and that there will be some humorous elements. How can you not snigger when you see Epik dangling from the end of a lance? NOw, here's a BRIEF recap. I don't believe in providing a synopsis of the story, that is what the book blurb is for. A review is to tell you what the reader's impression of the book is, and that is all. So, as you may recall in the first book Epik, our intrepid Halfling hero, had to step up and do some hero work and save the city with some of his friends. He succeeded. The only problem is, now the city is under seige. Gabby is out of the picture, and it is once again up to the wee fellow to step up to theplate and see what he can do. The result? We get a halfling knight, and a quest. The only problem, the object of this quest doesn't live up to its hype. What good is a land full of magic if no magic is there? Epik has to deal with princesses, jousts and treaties, just what every Halfling is built to do. Not! One might say that Epik is halfling full of himself; after all he's tried to be a wizard and now a knight. All I can say is that a lot of the city's flags will be flying at halfling mast if he fails in his mission. This book is not Halfling bad! 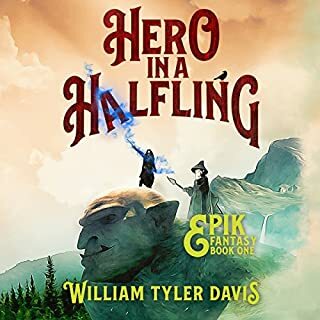 I have halfling a notion the third book in this series is going to be amazing if it is halfling as good as this book was. All right. I apologize. It just gets under my skin and I want to do it, too. That is a great title to use, and it really stands out. It is playful and fun, just like this series. Honestly, when you think of halflings your mind instantly goes to a really long been there and back angain trip that was never ending. Davis' work doesn't have that feel. The world here is more concentrated and less sprawling. The characters are much more fun, and don't nearly suffer halfling as much as our dear Mr. Frodo did. Davis has intermingled a serious story about danger and strife and overlaid it with humor and irreverance. Parody, satire, silliness, and sincerity drive the heart of the book. Look, it does have some serious stakes involved, but this book has a living and beating heart. I blame Davis and his excellent writing style; his observation and quips lighten what could be a dark tale and his timing, both dramatic and comedic, is spot on. His characters are absolutely endearing. I really missed Gabby, for example. You will love hanging out with them as they ride off to save the day, and when it is over you will feel like a high school graduate who will never see the majority of his friends again. Thankfully, the story ISN'T over, and we will be getting a third book. I really can't wait. 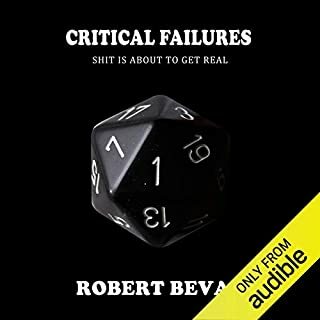 Mr. Davis needs to write faster, and get the audiobook out as soon as he can because I now have a halfling addiction, and I need another hit soon. Starla Huchton has taken over narration duties from Elijah DiViesti, and I can understand why. As much as I enjoyed him his readings were just "off" a little. He might have improved, had he done this book, but I must say Huchton has really taken the reigns of this runaway wagon with aplomb! She, like Davis, has an excellent sense of humor, and you can almost see the smirk on her face as she speaks. She can certainly speak a line in such a way that what would have created a snicker or chuckle rolls into a full on belly laugh. I had a few good chortles out of her readings. Also, I have to admit I generally find it jarring when a female does a majority of male voices or takes over from a male narrator. She, however, manages to provide realistic voices for each character regardless of their gender. I look forward to her continuing the series as it progresses, I think she is a wonderful addition to Epik's cast and crew. Even though I did receive a promo code for this review it in no way influenced my considerations of the material, and in fact, inspired me to be more honest. In fact, getting a code generally makes me harsher as a reviewer as I am more often concerned what someone like Me will decide based on my review. The bottom line is that this is a fun, exciting, and adventurous series filled full of memorable characters, excellent villains, and super settings. I would, without question, love to go and visit the place, an spend some time with Sir Epik and his friends. I have no doubt that you would too. Don't be daft. Get in while you can, and enjoys some frivolity and hijinks! I really enjoyed this book on my kindle so when I had the opportunity to listen to it I noticed the narrator had obviously enjoyed the book herself since she seemed to emphasize the same things that my own reading seemed to point out as important too. Yes, it threw me for a loop for a moment when I found the narrator to be female (the protagonist in the books happens to be male) so instead of being the voice of the characters it felt like she was enjoying it at the same time I was so it gave me a voice for my own self reading the book. I thoroughly enjoyed it and will be wanting to get to book three ASAP! The cream in an oreo cookie. Siestas. Fall and Spring. As a reader, I love nothing more than to settle into a familiar world and follow a beloved cast of characters on a new adventure. The second volume in Epik's adventure is an excellent middle. Davis spared no time reuniting me with Epik and his crew and immediately threw new conflict into the mix. Davis' writing is adept and it shows that he honed his craft between the first and second books. The humor in this one is less in-your-face and more situational--perfectly balanced with just the right amount of zest to coax a smile or chuckle. Huchton's narration is also deserving of praise. We all know how important it is for a narrator to be able to distinguish one character from another--and she nails it. Her range of accents and voices is diverse and distinct and serves each character well. Her talent adds yet another layer of detail to "Knowing is Halfling the Battle." Epik's second adventure continues to nod to the works of Pratchett and Adams, while also making larger strides towards autonomy. I adored how much attention Davis gave to Gerdy in this installment. He allowed Gerdy to express her insecurities honestly while also allowing her to discover her strengths. I'm eager to see the direction Davis takes the series in the future! 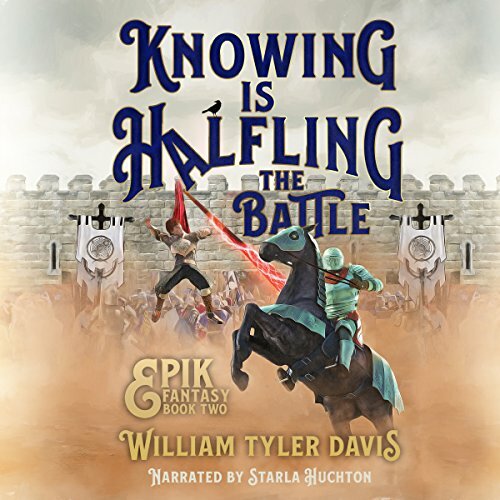 Would you listen to Knowing Is Halfling the Battle again? Why? Would definitely re-listen, plenty more to discover. This book had excellent character development. Have you listened to any of Starla Huchton’s other performances before? How does this one compare? Starla did a really good job. First time listening to her narrate. After I started I couldn't put it down. I really enjoyed the 2nd book in the Epik Fantasy series. It had a lot of light-hearted and fun moments and I really enjoyed the characters in this one. I liked this one better than the first book because the characters are already established and we can jump into the action a lot quicker. The narrator was also much better this time than the last book. I hadn't actually read the first book in this series so was a little unsure to start with, but I had been advised that I would quickly pick things up anyway if I did start with this one and that seemed to be the case for me, so people should not be dissuaded from this book even if they haven't read/listened to the first one. 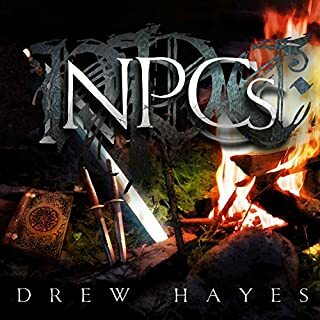 This book is sort of a new start for the hero Epik, a halfling, as he is currently training to be a knight, but events quickly force him and his friends to embark on a new quest to deal with the ruler of a kingdom controlled by dark magic. This fairly serious setting is offset by the tone and style of the writing, which tends towards being lighter, less serious and more humorous. I don't think I would actually call the writing funny, but it was enjoyable and the humour definitely tended to enhance rather than detract from the story. 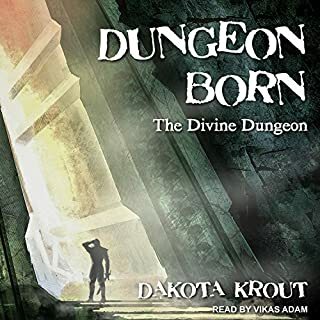 I was not familiar with this narrator, but found her performance to be a pleasant one with sufficient variation to ensure the main characters all had distinctive enough voices, which is crucial for the narration to enhance a story like it did with this one. 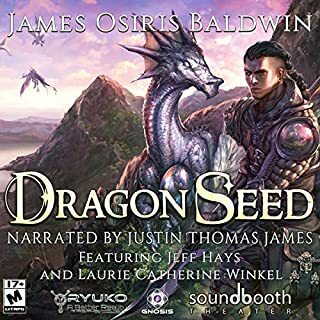 Overall, an enjoyable listen and I will definitely look out for new books in the series and probably go back and get the first one too.